I did not tell my kids that I got them a new lunch boxes so when the package arrived, I asked them to open it up. They were very happy and excited to see that they have new lunch boxes this year. Adding to the excitement is the fact that the lunchboxes has their names on it, yay! Thanks to "I See Me!" for these beautiful personalized lunchboxes! I received two lunchboxes to review but I will write about my son's lunchbox at my food blog. I really love the way this looks, I love the butterfly design and I love the fact that there's not only one name but in three different sides. My daughter was grinning from ear to ear when she saw hers because she love butterflies! I can't wait to start making their lunches again on the days that they don't like what the school is serving on particular days. I would rather prepare their food everyday than pay $2.50 per meal but sometimes, they want to eat the same food with other kids in school so I let them choose what menu they like. Reading is part of the activities that I set for my kids when they got off from school and so I entered to the "Summer Reading Sweepstakes" sweepstakes that I See Me is sponsoring! 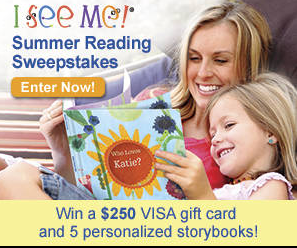 My kids would be so thrilled if I get to win the Grand prize which is a a $250 Visa Gift Card and 5 Personalized Books! I am keeping my fingers crossed! Aside the from the grand prize, they are also giving a personalized coloring book to 25 Runners Up. So make sure to enter the sweepstakes before it ends on 8/31. You can enter here. What other cool stuff does I See Me has to offer for Back To School? Well, not only they offer personalized lunchboxes but they also has puzzles, coloring books, placemats, stickers and growth charts! They have something for everyone for every occasion! Their products would really make great gifts that I am sure every child would surely love to have. If you are like me who has kids that love personalized stuff like these, like and follow I See Me on their social network such as Facebook, Twitter, Pinterest, and Instagram. Below are some fun photos of my daughter pretending to go to school on the first day. That's actually the dress she plan on wearing on Monday lol. Thank you very much I See Me!! Two things that stand out for me here. Firstly, we got the tin lunchboxes from our childhood back! Secondly, it has my name on it! How cool is that! Nice, I never had a tin lunch box or any kind of lunchbox when I was a kid so this is so especial for me and my kids! These lunchboxes are so cute! I actually have one for one of my daughters as well and she really loves it! I know right, who wouldn't? My kids classmates really liked it! personalized lunch boxes is always wonderful to give to kids because you can make things different and with the things they like. I always make the food that they like so they would eat them! My children will love to have a lunchbox like this especially my daughter who is very much into personalized things. You should get her one. I think they ship world wide. My Pakoy will surely love having a personalized lunchbox. For sure, it will not get lost. BTW, your daughter knows how to pose. Thanks Papaleng, I think every kid would love to have a personalized lunchbox. Hahaha, you should order one with your name on it Ate Bet Chai! My kids truly love them!! I love personalized stuff. and this awesome tin lunchboxes are the best! You should buy one for LOgan sis. I love items that are personalized for my little one! This lunchbox is so cute! I am definitely going to check out the website! Kids just exudes that pride of owning personalized items. I love the vintage -esque tin lunch box going on. She looks ready and rain for school. I love it too and even her teachers like it. With lunchboxes like this, I no longer have to put sticker labels to identify that it's my son's lunchbox. This is so cool! You got it right, no more labels needed as it has her name in it already. Yes it is. It also inspires us Moms to prepare good food for them to eat. That's such a cute lunch box, I would love to get something like that for my daughter. You should get her one, they are very affordable!